FADA supports Laguna Art Museum's Rex Brandt: In Praise of Sunshine. Laguna Art Museum presents a retrospective exhibition of the paintings of California landscape artist Rex Brandt (1914–2000), curated by Curator of Historical Art Janet Blake. 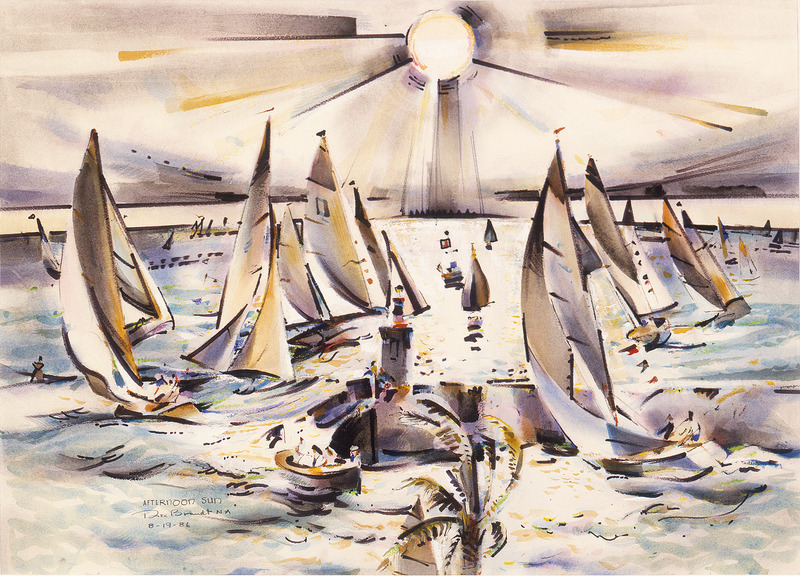 Rex Brandt gained national renown for his watercolor paintings during the period from the mid 1930s to the 1990s. As a dedicated teacher of the watercolor medium, he conducted painting workshops both at his home in Corona del Mar, his summer home in the San Juan Islands off the coast of Washington, and at several international locations. Rexford Elson Brandt was born in San Diego in 1914. He grew up in Riverside and attended Riverside Junior College and the University of California, Berkeley, receiving his degree in 1936. The art department at Berkeley was decidedly modernist, in part a legacy of the German abstract artist and teacher Hans Hofmann, who taught there in the summers of 1930 and 1931. Brandt’s teachers at Berkeley included John Haley and Margaret Peterson, both of whom had studied with Hofmann. Brandt also studied Byzantine and Chinese art, both of which influenced his painting style and his teaching. After returning to Southern California, Brandt joined the California Water Color Society and became an active participant with artists of the American scene including Millard Sheets and Phil Dike. He was a champion of the so-called California school and organized one of the first group exhibitions of their work, in 1937. In the post-War era, Brandt eschewed literal representation except in his teaching and instead focused on complex, semi-abstract studio works in which he explored the effects of sunlight. Exhibition support for Rex Brandt: In Praise of Sunshine is generously provided by Diane and E. Gene Crain; Martha and James Newkirk; Janet and Mark Hilbert; Ruth Westphal; Ken and Jan Kaplan; John Moran Auctioneers, Inc.; Fine Art Dealers Association; and Jeff and Bernadette Olsen.